The final round of South Africa’s pool phase Interprovincial series reaches a fascinating climax this weekend with five of the six teams having a chance to make the final. This year’s Interprovincials began 9th July, with 2015 champions Border cruising to 74-3 win over South Western Districts (SWD), while Blue Bulls – finalists last season – lost to narrowly 14-10 to Kwa-Zulu Natal (KWZ) and Eastern Province beat Western. Two weeks later, round two ended with Border the only unbeaten team – and apparently well on their way to another title after a comfortable 27-3 win over KWN. Blue Bulls were back in the running after beating Eastern Province, while Western Province thumped SWD. However, round three on August 6th changed everything. Border entertained Western Province in a hard-fought game. 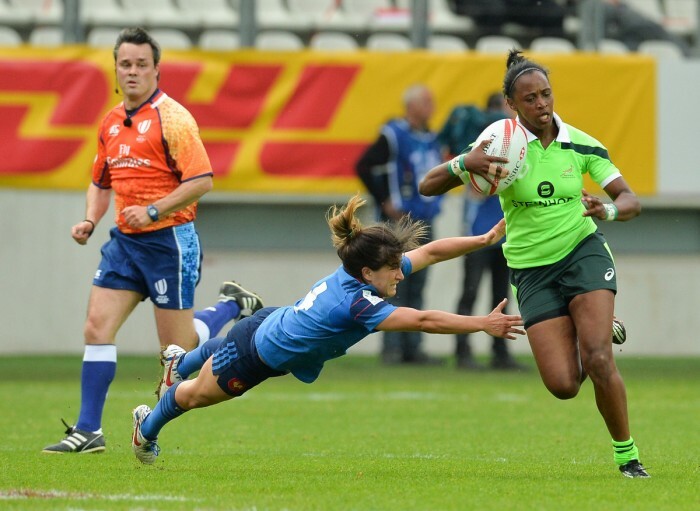 Both sides crossed the try-line in the first half, with Springbok Women’s lock Celeste Adonis touching down for Western Province, with a successful conversion by Kirsten Conrad, while Eloise Webb scored for Border – but the champions’s kick was missed. Those proved to be the only points of the match, resulting in a 7-5 win for Western Province, and Border’s first defeat since 2013 (when they also fell to Western Province).With Blue Bulls and KWN also winning again four teams were on two wins – Border and Blue Bulls held a narrow lead on 11 points, and Western Province and KZN on nine. The last round was on 20th August. A repeat of last year’s final saw bet Blue Bulls 19-0, captain Zintle Mpupa, centre Aphiwe Ngwevu and prop Asithandile Ntoyanto scoring, while the match between the two other rivals saw Western Province beat KWN 12-11 - Western Province overturning an 11-5 halftime deficit to win thanks to a brace of tries from by Springbok lock Celeste Adonis, with one successful conversion. As a result this weekend’s final round clash between WP and the Blue Bulls, in Cape Town, is effectively a semi-final, though WP begin with a two point advantage over Blue Bulls. Border can only be overtaken by WP, but if they were to lose to Eastern Province both EP and KZN could draw level with them (though Border retain a sizable advantage in match points difference. The top two teams will play in the final, which is scheduled for Saturday, 17 September.